Well, it has been almost two weeks...so I guess I should post something about my new ride. This is a 2003 Trek 5900. This is the exact same bike Lance Armstrong used during parts of the 2002 and 2003 Tours de France. I picked it up from a guy here on the island on 16 February but haven't had time to post. Plus I had to do a major cleaning job on it that I still need to finish up this weekend. So far, I have already taken off and cleaned the chainrings, did some deep cleaning in almost all areas, cleaned and the replaced the cassette (changed to a 12-27, thanks John! ), new bar tape, etc. It is starting to look pretty good. I rode it all this week and it is riding pretty good, just a few more areas to clean up and it will be good to go. This weekend I participated in the Mokuleia Time Trial, a 20K TT out and back. It was a good race with a pretty good turnout. The ride out was great but after the turn around, we were hit with a pretty good head wind. Spotted a couple of familiar fellows warming up on some strange contraptions. John saw a ghost but he didn't let it didn't phase his warm up one bit. Steve and Bryant trying to see who has the better balance while Kelly looks on in amazement. Bryant looks to be having a little trouble. Bryant gets it down...Jon doesn't seem to be too interested in Bryant's skills. After the race with the Griffen! 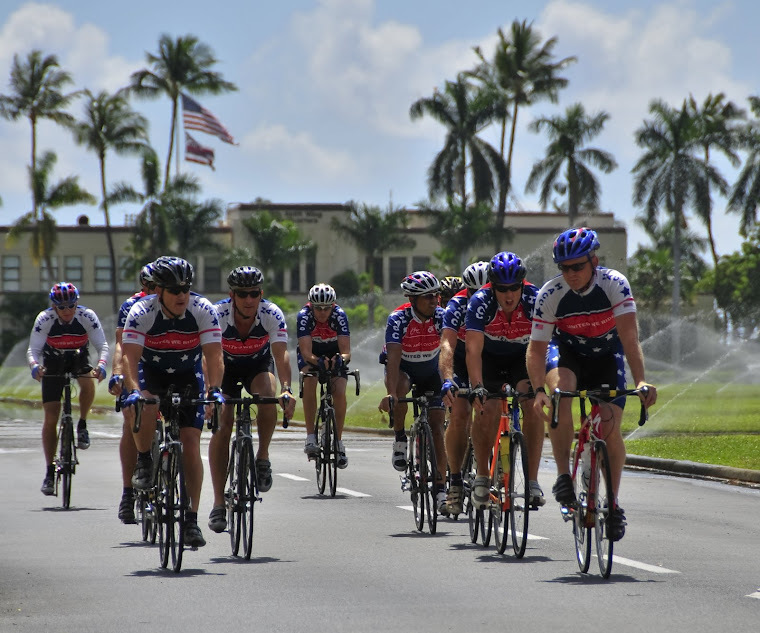 Today was the second criterium put on by Momentum Multisport at Kaneohe Marine Corps Base, Hawaii. 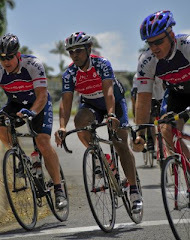 Since it was originally put out that Category 5 riders should sign up for the Cat 5 race, that is what I went with this time. I later found out that I could have done the Senior race since I scored points in the last crit, but I decided to go ahead and race the Cat 5 race. Since I was dragging Goy and Damien along with me, I showed up late and missed the Expert and Senior races. We got there just as the Womens race was starting. It was a little windy for our race but still a nice day for racing and we had a pretty good size group for our race. Here we are getting ready to start. A group of 5 or 6 of us got out front early as the lead group. I took a flyer off the front and opened up a pretty good gap. I think I stayed away for about 3 or 4 laps. Here is my #1 fan...but don't ask him, he'll tell you a different story. I was doing great in the race and was set up for a top finish for sure until about 3 laps from the finish I noticed something going wrong. As I put pressure on my left crank, I noticed my foot was turning. I thought the tension in my pedals was allowing my cleat to slip, then I thought my pedal was coming out of the crank arm. When I looked down I saw what the problem was. I had broken the crank arm and I was bending it as I put pressure on it. Since I only had about one more lap to finish by the time I figured this out, I decided to go ahead and finish. So, I ended up pedaling about the last four laps with a broken crank arm and did the last lap basically one-legged. Despite all this, I didn't finish too far behind the lead group. Here are some pictures of what my crank looked like after the race. I did talk to a friend of mine who works at the store where I bought the bike and he said they will replace it since it looked like a manufacturer defect. I plan to take it by there tomorrow during lunch. and this is his SCARRED STORY!!!! Damien and I went over to the skateboard park tonight after work for his first try on some ramps. He did pretty good but came home with a nice little boo boo on his knee. Here are some more shots of him in action. Just another day in the life of a skater!